I met my first celebrity this week. He may not be recognizable to alot of people, but I’m quite a fan. I went through a food phase, and wanted to learn all about cooking. I found that this guy and his show Good Eats on the Food Network did the best job of actually teaching, as opposed to “recipe distribution”. I drove down to Manhattan to a book signing for his new book and stayed with a friend I used to work with in Austin, Adam. 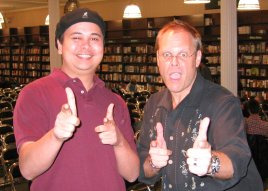 Alton Brown is a very down-to-earth, approachable guy. I made a reference to Office Space when talking to him “If you can do a double-pistol pose with me, that’d be grrreeeat”, and he finished off, “I’m gonna need you to come in on Saturday, mmmmyeaaaah” I posted more photos on a fansite here. I had a great time, the wait in line was definitely worth it!